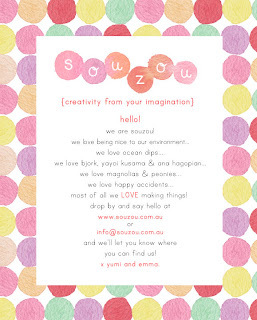 Thank you Emma, for starting up such a beautiful blog for our blossom sou zou! My name is Yumi and I am Emma's friend. We went to school together and now we have created sou zou together. Recently I went on a little trip down the south coast with my mum. We stayed at a 100yr old cottage near Berry. It was beautiful...we had our own organic veggie patch, goats, sheep, geese, ducks and chooks. I felt like I was living the life of Anne of Green Gables...being a city girl all my life, I am in complete awe of this lifestyle and was loving every moment! So Feeling Fuzzy? has been renovated and has been renamed Souzou. Yumi and I were chatting about what kind of online site we should have for our venture, and we both decided that keeping another site going was a bit beyond us. So Feeling Fuzzy? and Souzou have combined their powers! 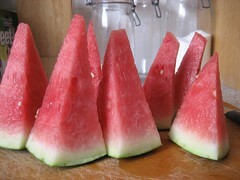 Hopefully Yumi will start blogging which I think will be a treat! Other than that nothing much will change. I've just come back from a week at Mackeral Beach, hosted by Patrick. I'm feeling a little nostalgic already and thought I'd share some pictures. Patrick returned from the UK bearing gifts last week - mine was a brilliant kids book "Jour de Pêche" by Laurent Moreau - lucky me!! And even luckier there are no words in this book, which could have been tricky as I know not a lick of french. I've worked out so far that the title means "Fishing Day", though I might have to double check this with Patrick! Happily his present to NP kept us entertained for most of last week with marathon sessions of Risk. Quite addictive in a despotic kind of way. Yumi and I went along to the Finders Keepers markets held at Carriage Works last month - such a beautiful space and such a lot of talent. I was lucky enough to poach a Beattie dress which is the highlight of my wardrobe. Yumi and I had terrific fun hosting Lana (8) and Scarlet's (5) birthday parties last November - we made lots of fun things and ate lots of chocolate cake! Yumi and I took our dear friend Kirsten out for a mystery birthday celebration last month. It was a very chummy day made even better by the lovely Eddie of The Little Marionette hand delivering our food to the park. Last week I was looking through photos on my camera and found this mystery shot. It looked like something I might have photographed but had know idea what it was. Turns out NP had borrowed the camera to take photos of fibre optics - who knew they could be so good looking? Apparently he was trying to demonstrate why it takes so long to repair a fibre optic cable. Not even the craftiest nanna could get this mess under control! Thank you so much to everyone who popped by to say hello while we were at the Marrickville Markets. We had such a lovely day (despite the gusty winds). Our little finger puppets were a hit, we were madly stitching new ones to pop on the stand for most of the day. It's been a little while since the last post, so I've got lots of catching up to do! We've finally started to see some summery weather in Sydney, so I'm feeling particularly excited!